Want to dress up as the Fashion Police for Halloween? Here's how! Dress up in your most "fashionable" outfit. The more brand name labels, the better. Wear a police hat, sunglasses, and carry hand cuffs (both available at toy stores/costume shops). 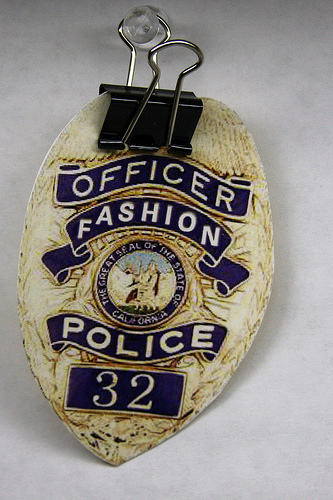 Make yourself a badge to wear that says "Fashion Police". Add a utility belt stocked with makeup and hair products, like a big can of hairspray. Get a pad of paper and a pen and walk around handing out "Fashion Violation" tickets.